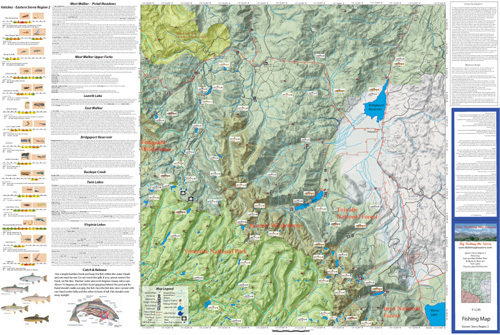 Covers the East Fork and West Fork Walker River, Bridgeport Reservoir, Twin Lakes, Virginia Lakes, Robinson and Buckeye Creeks. Shows topographic relief, GPS Long./Lat., camping areas, road access, and trailheads. Special Features are Suggested Flies, Hatch Chart, Fishing Season and Regulations, Fish Identification, Catch & Release Procedures, and Stream Etiquette guidelines. Printed on Rite-in-the-Rain Paper that will allow you to write those special notes. Waterproof and Durable.